As much time as I spend on paper and in my head, sometimes words must be spoken aloud. Good afternoon. On behalf of my family, thank you for joining us as we give witness to my grandfather, as he walks into the unveiling of the next life and leaves this temporary home. Almost a year ago, I stood and attempted to say words about my grandmother. It was difficult, and I was only able to write for her at the last minute in the middle of the night on the day before her funeral. On the other hand, words for my grandfather have been running through my mind for quite some time and settled onto paper some days ago. And then again when I went through twenty-five albums of photos. His love for us and his happiness was obvious, and the child I was reaching out from those photos with him showed the same. It was a magical childhood, and he was a big part of that. So was Meema, of course, but she was a bit of a paradox to me. She was someone so unlike me and yet loved so much. But Pappa runs in my veins. I see his reflection in so much of what I do. Who would I be without the love of intellectual debate, a fiery temper, and a deeply held reclusive temperament? He is a mystery to me only in that I do not know all of his stories or memories, but his nature is my legacy, and I cannot escape it even if I wanted to. That makes his passing all the more private and seemingly significant for me. But, being who I am with him as part of me, I will try to bear witness. My grandfather started off as a miracle. From the beginning, Pappa knew the pain of abandonment and loss. At his birth, he lost his twin and his mother. Shortly thereafter his father distanced himself as well. And, then a miracle and a supernatural blessing happened when he was taken in by his grandparents, Louis and Eppie, my namesake. They raised him as their own, and so he became the youngest member of the tribe of Pattillos. I wonder how much of the man I know came from these early days. I choose to believe he first learned his deep seeded belief in the grace of God from this earliest miracle. 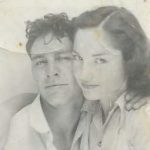 The next miracle of my grandfather’s life, that resulted in miracles for us all, is meeting and marrying Peggy Jean Chaney. 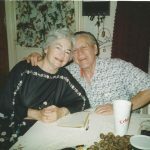 Remembering Pappa cannot be disconnected from his wife, his complement, his lifelong passionate love affair. He and Meema are my foundation and served as such and so much more for many of us. For over 66 years, they persevered and loved, worked and vacationed, cried and laughed. She didn’t just stand by her man; she danced with him, and I dare say, she led more than half the time. Oh, but she knew her limits. Many a time, he withdrew to his cave, and she didn’t just let him, she knew it was good and right in a way the rest of us were not quite so sure about most of the time. Pappa’s quiet times usually resulted in one of his projects, and though I remember a few pursed lips from her about many of them, Meema seemed to know that it simply had to be. His projects were many and varied. There were the tombs written about the tabernacle and the rapture. Some of his other endeavors included his knowledge and talent with cars, hours spent reading books, the short foray into Atari games, rides on motorcycles, a never-ending epic roof project, and a near-fatal incident with a flaming pilot light. His burns from that project gone awry were a delightful source of fascination for me as a child. Meema would lean against the doorway between the kitchen and dining area shaking her head while he sat at the table pulling back the gauze on his belly to reveal the latest status of burnt hair and oozing wounds. Indeed, my grandparents were a mischievous couple, and Pappa could be quite playful all on his own as well. He burped loudly after a good meal, and Meema sighed, “Pappa.” He was also known to throw out a “whiskey” in a husky voice. Together they took us to several questionable movies, yeah, just try watching Pretty Woman in a full theatre with your grandparents. They may have not thought a thing about it, but I turned every shade of red in the span of two hours. And the flirting, it was endless. Footsies under the tables, knowing looks, and kisses. Most of us were somewhat scarred by walking into a room at the wrong time or overhearing a moment meant only for an R-rated movie. Not until years later did I realize how marvelous and beautiful it was to see a lifelong match so full of understanding, passion, and joy, not beholden by pretense or legalism. In this last year, we all quite frankly wondered what he was waiting for. Who knows the mystery of why he waited even this long to see her again? Jesus told us marriage is not the same in the hereafter, but I refuse to doubt they will know each other immediately. To think that in this life they only saw each other in a mirror darkly gives me shivers. The next major miracle is his legacy of not just flesh and bone but of the spirit. Pat, my dad, Cynthia, and Bobby walk lives of faith, not perfect ones but the kind of lives that witness to the tenderness of God, the lover of mankind. His earthly children had to share him though, and his life as a minister spanned the decades with baptisms, weddings, and funerals, long trips to a church in the country and meals with parishioners. He prayed, doubted, studied, argued, and preached. Together, he and Meema adopted many and saw many walk closer to God. He served as a second father to my cousin David and to so many more who were not of earthly blood but of the blood of Christ. As my dad proudly said to me days ago, these sacrifices for the witness of Jesus Christ were the most important legacy of his life. Strangely, I knew little of my grandfather as a preacher. He retired a few short years after I was born. I do remember one occasion at Broadview Baptist, my childhood home when he was guest preaching. I have no idea what the actual topic or verses were, but I remember at the end of the sermon he sang, “Que sera, sera. Whatever will be, will be” in a haunting voice. And, I thought, “This is the man.” Now, I think he was echoing something deep in his heart. And to that end, my grandfather is a miracle because of his very imperfections. He was who he was. It is not customary to speak of the faults of the dead in our time when we have a funeral. However, this life is not just for celebration but for remembrance of sins and death. Only then do we begin to know what humility is: He is God, and I am not. The mystery of my grandfather finds itself in us all, the weaving of sin and gift, pride and repentance, silence and sharing, and the realization that His providence finds gold in the dust. Pappa was not always an agreeable man. His anger and vanity left marks on those he loved, and yet, light and life and love rise from those same scars. I did not have conversations with Pappa in this life so much as that I absorbed him. I witnessed his life, a heritage of a stubborn sinner who oscillated between falls and floundering to ultimate flourishing because of the grace of God in Jesus Christ. His life is a witness to the miracle of abundant grace, a mercy without end. The struggle has come to an end for my grandfather. He will stand in the fire, and only what is real, the generosity and the love and the laughter, that remains. And it is beautiful. All mortal things are vanity and exist not after death. Riches endure not, neither doth glory accompany on the way: for when death cometh, all these things vanish utterly. Wherefore let us cry unto Christ the Immortal King: Give rest, in the dwelling-place of all those who rejoice to him who is departed from among us. Good afternoon. For those of you who don’t me, I am a granddaughter of Peggy whom most of us grandkids and great-grandkids call Meema, the spelling of which is still up for debate. I realized in writing these memories that she spent a little over half her life as a grandmother. She was just a bit older than I am when I was born, and I see now how young she was. When she would recall seeing me as a newborn as my dad carried me out to the family for the first time she’d always say something like, “I saw those big eyes and thought about Pat and then that you were so alert and taking everything in.” She retold that story each time like it was new, and said it in such a way that I felt special and important. She was like that. She remembered details about a person’s life, and that remembrance, in turn, made her special. Even in the last weeks at the hospital, she kept tabs on her nurses, surprising them by later reciting little facts about them. As an introverted and rather stoic child, I felt it was an abomination to ask endless personal questions of waitstaff, store clerks, movie attendants, and all other unknown entities, but she felt it was more than polite. It was a must. Meema noticed people and in turn, they gave her so many details of their lives, but she didn’t share those tidbits unnecessarily with anyone else. She worked not to speak ill of others. The rare times she was frustrated with someone I can remember her pursing her lips and maybe if perturbed enough she might roll her eyes a bit. There were indeed a few things that could garner such a response: conceit, vanity, and the love of money or material things. Indeed stuff wasn’t important to Meema. Anything used was better than anything new. She loathed spending money. My mom and I recalled recently her insistence on keeping vacations cheap. She insisted on having a picnic with sandwiches when we drove to Ruidoso each summer. Inevitably that meant eating outside in the heat and barrenness of eastern New Mexico because no one could wait until the end of a 7-hour trip to eat in the mountains. I felt it was a terrible start to a vacation, but my grandmother never minded if things weren’t perfect. In fact, she had the expectation that things would get a little messy. I have many memories of mud baths and fruit stained faces, but some dirt and grime in life are not fixed with water and a tub. As to those more difficult messes around her, of those times I seldom heard her speak of. Instead, I often wondered if she absorbed them or let them simply wash over her. As a granddaughter, I was not always privy to her struggles except maybe towards the end of her life. Either way, she remained, as a former music student noted, “unflappable.” A person of God was to be loved despite the mess. And Meema didn’t love mankind in general. It is easy to love the idea of human beings and never realize it’s the particulars that test our love, and she loved each one of us in particular, favoring the wayward, the weak, and the weird. She embraced the good and the bad. To be frank, the Pattillo side of our bunch is a bit on the cranky side. I come from a long line of stubborn recluses who frequently burst into rants on the benefits of apple cider vinegar or an obscure aspect of theology, which shall not be named. I fulfill my duties admirably as a partaker in this heritage. On occasion, my grandmother would have enough of such stuff, but for the most part over the years, she weathered such eccentricities like a seasoned mediator trained in conflict resolution. She put up with us and loved us all the more because of our uniqueness. She too had her own special flares. First, she was a believer in free-range parenting before it was a trend. I remember wondering around the HSU campus — horny toads around the fountain, escapades in the practice rooms of Caldwell, and snacks at Moody — all without adult supervision. And the latitude she gave my dad, aunt, and uncle would make a parent of today shudder. I know this for a fact because she cared for both my boys as babies, but it was also okay because she loved those babies and prayer works miracles. Second, leftover “soup”. This was a result of admirable frugality run amuck. Everything in the fridge not growing mold (hopefully) went into these concoctions. I think because Pappa consumed these creations, she assumed they were always good. They were not. However, she did make divine red velvet cake, monkey bread, pecan pie, and green beans with vinegar and loads of brown sugar and onions. Third, her driving was tolerable on good days and hazardous to others. I remember a left-hand turn from South 27th headed south onto Treadaway from the wrong lane. She did not notice we almost collided with the car in the real turning lane. When she spoke to the person in the passenger seat, she turned the wheel ever so slightly in their direction. I have vague memories of correcting our wayward car with a “Meema, the road!” Once, on the way to visit relatives in the Metroplex, she drove a manual transmission down I-30 at the speed limit but in 4th gear. Fourth, she was efficient at washing dishes, fixing meals, and in the other means of hospitality, but one touched a rag in her sink with the greatest caution. It might have been since two Sunday meals prior that it had seen the washer and was not so much fit for cleaning as it was a science experiment. As with the remembrance of any person at their death, I could say so much more — Sunday naps, ill-timed jokes because she couldn’t stop laughing, love of 42, an uncontrollable desire to talk and laugh loudly in movie theatres, visits to relatives, road trips and reunions — yet a person is so many more words and stories than these and no amount of them is ever enough. So I will say this, it is obvious from her life that she was a follower of Christ. She knew what it meant to pick up her cross. She died to her wants and desires to accept and love others on a daily basis. At the end of this life, she stood at the abyss of death and in her final weeks and days embraced this ending in hope and faith and love. In this mysterious life, our Lord Jesus makes it so that beautiful beginnings may be resurrected from an ending. Thus, her death is the entrance into a new life. While we wait for our own entrance, our memories fade of her, marred by time and our own weaknesses. And so, we ask, “May you ever be in God’s memories” until we shed this dim mirror and see you face to face and know you as you now know us.